Ready to be placed on the tabletop! Made from High Quality Resin and beautifully painted, this set includes two (2) linear walls made from brick sized, dressed stones. The Stone walls enhance your Outdoors or Urban Tiles; or can used with gaming surfaces you already own. 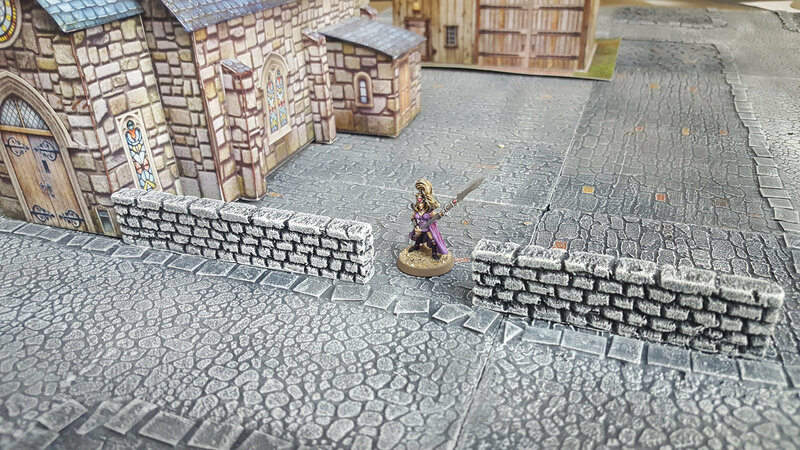 The completely revamped and redesigned Pedion Stone Walls can be used in any Fantasy, Ancient, Medieval and Modern environs, and in scales from 15mm to 32mm. Each Set includes two wall section at varying lengths; the longer section is 12cm and the shorter is 10 cm. Both walls are aprox. 1cm thick and 2.5cm high. Their varying lengths allow for multiple linear placings, work well with the spaces on Pedion Urban tiles, and with two such sets you can create a 12x12cm walled enclosure. Great for Age of Sigmar, Kings of War, Frostgrave, Bolt Action, Flames of War and Runewars wargames, as well as role playing game sessions. Miniatures and buildings shown for Scale purposes only.